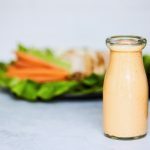 This gorgeous, vibrant Paleo Green Goddess Dressing is ready in under 5 minutes and it’s loaded with so much flavor. 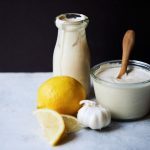 This creamy, dairy-free Whole30-compliant condiment can be served up as a salad dressing, dip, sauce or spread. Sorry not sorry in advance if you become as addicted to it as we are! 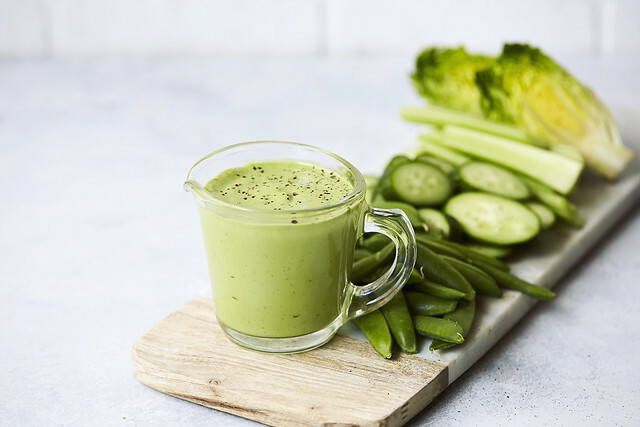 I am not sure exactly where the term “Green Goddess” originated when speaking of a tasty green dressing, but I am not mad about it. Not at all. Clearly something this beautiful, brilliant and delicious is female! DUH. 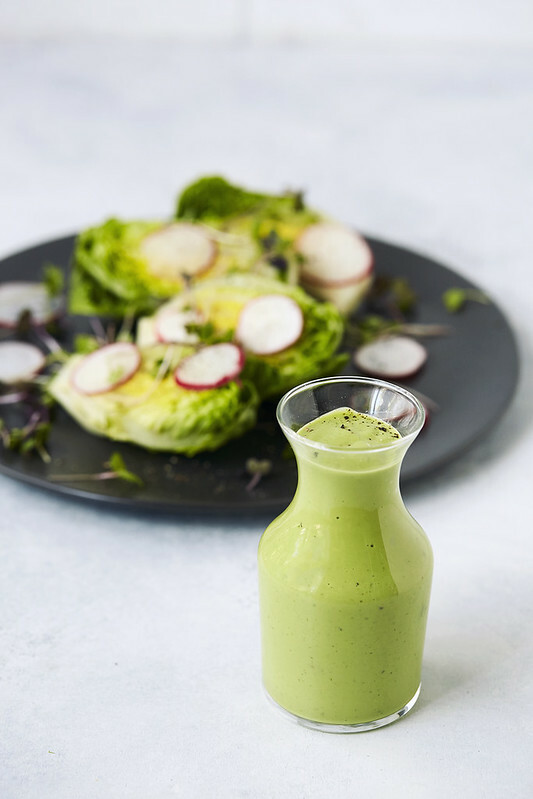 I have seen many many iterations of the Green Goddess dressing and many call for yogurt or other dairy and ALL the green things. 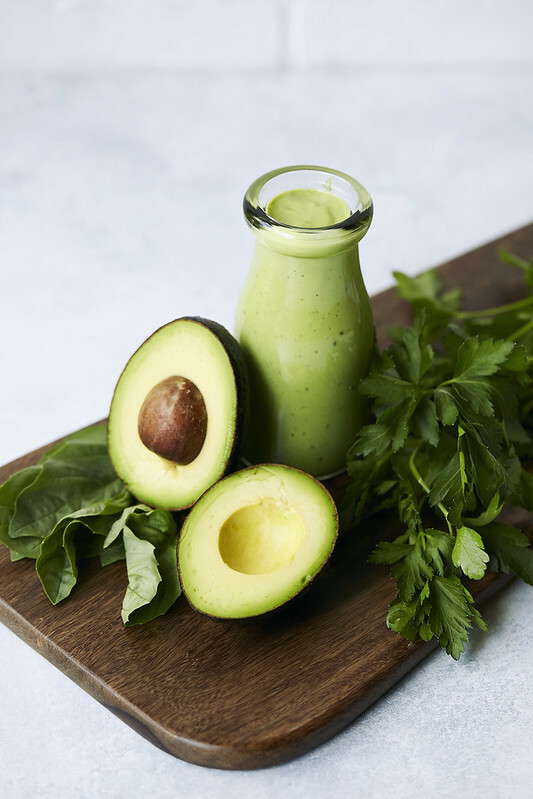 This particular rendition gets it’s creaminess from avocado and delicious avocado oil mayonnaise. There is a prominent basil flavor and aroma which is peppery and fresh, with parsley is a backup singer. If you want to have some fun, swap out the basil with cilantro (I’d say go with more like 1/2 cup since it’s a bit stronger), swap lime for the lemon and add jalapeño. Voila, another version of this amazing sauce. 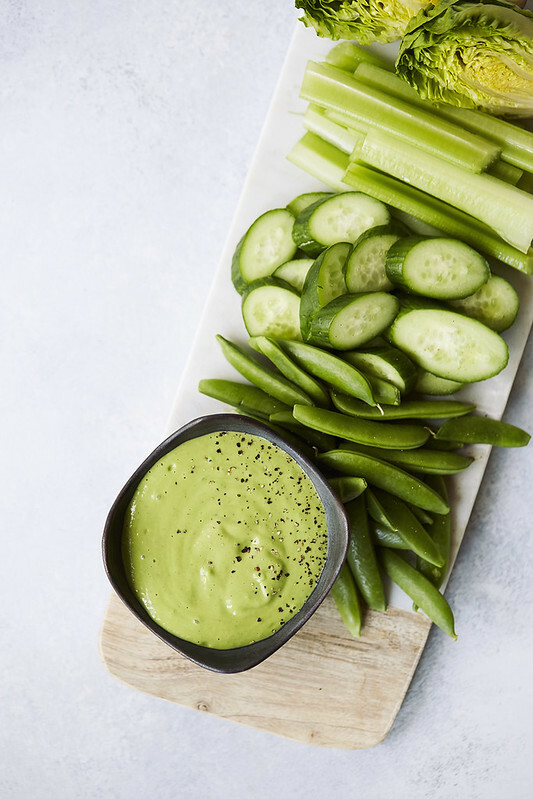 While I love this Green Goddess Dressing drizzled over a beautiful seasonal salad, it’s also amazing just as a dip with crudités. You can also dip your favorite chips or crackers in there. Keep it a little thicker and use it as a spread on sandwiches and wraps. Swap it for mayo in an epic homemade chicken salad. 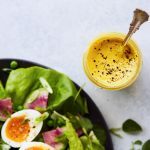 Loaded with healthy fats, this dressing should be a kitchen staple – no matter how you serve it. As of late I have become obsessed with these gorgeous little gem lettuces. 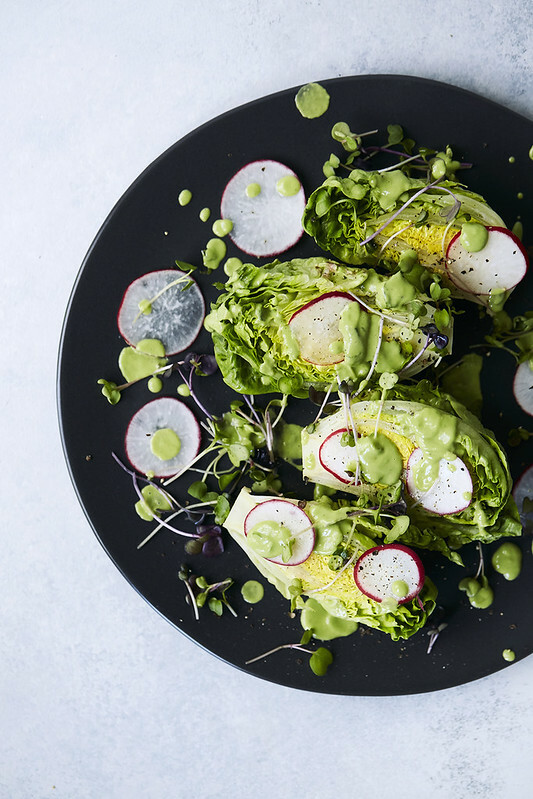 Halved and topped with some micro greens and thinly sliced radishes, a Jackson Pollack style splatter of this Green Goddess Dressing and life is grand. Everything is right in the world with a masterpiece of a salad like this! 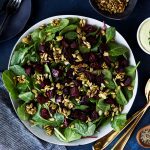 Add all of the ingredients to a high speed blender or small food processor. Pulse a few times then blend until well incorporated and super creamy. Add more water as needed to reach your desired consistency. 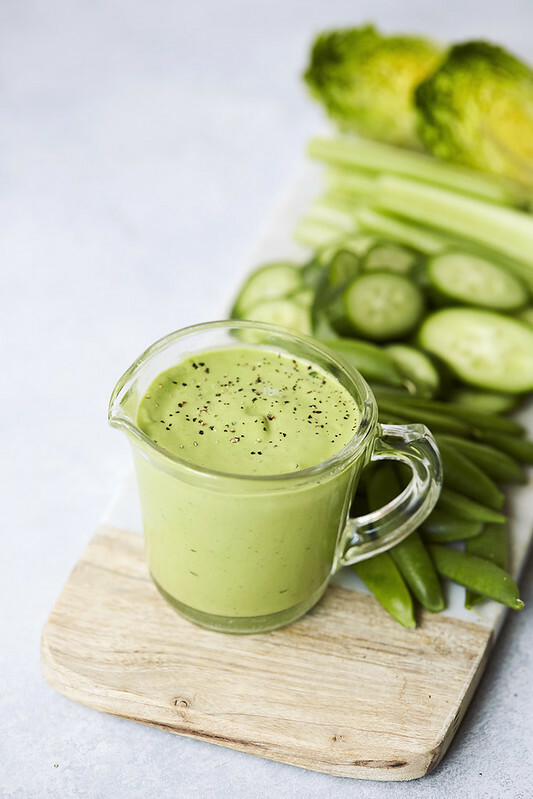 This can be served as a salad dressing, dip, sauce or spread. 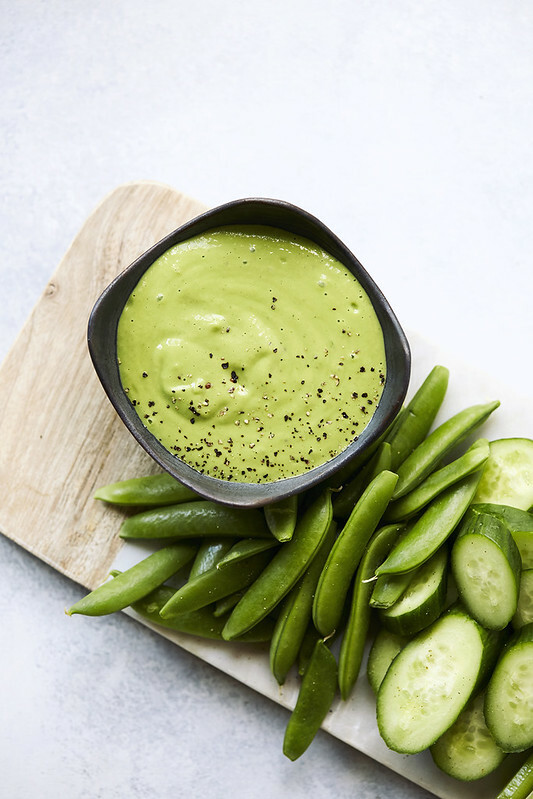 This farm girl would love to dip into this green goddess dressing.